When we moved into our house in October of 2008, we were greeted with the same poo-brown carpeting, that you can see here, that Kevin’s parents had installed when they bought the house back in 1988. We were also informed that, unlike other midcentury pillbox ranch castles of that era, ours had no hardwood floors under the carpeting. THE HORROR. So, we’ve lived with the poo-brown floors, always with the plan of replacing it with brand new hardwood. 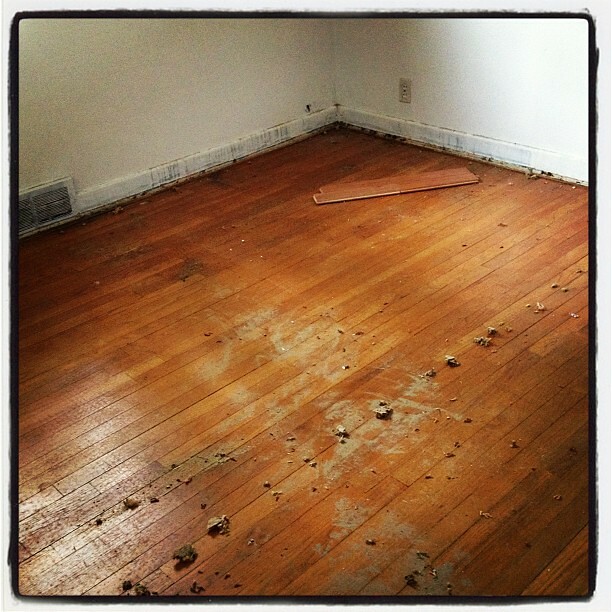 The only room on the main floor without that under the carpeting was the living room. So, back to Menards those prefinished packs of wood went, and we came home with enough unfinished wood for the living room and plans for Kevin to refinish the whole main floor himself. Yeahhhh, about that? Apparently, it’s a lot of work, and kind of a highly-specialized type of work. I have no doubt as to Kevin’s abilities to get the job done, but he’s an auto-body man, and his propensity for picking apart his own work was sure to drive me crazy for the next 10 years of him complaining about whatever it was that he messed up as he was learning the process. I’ll have NONE OF THAT. So, we’re hiring somebody local who comes to us with good recommendations, and the work is set to begin on June 28th! Less than a month before my due date! It’ll be okay!